If you're a regular here at JustJulie, you'll know that I'm always wearing a cat flick liner. My eyes feel naked without a flick, so it simply is a must have for my makeup look, whether it's during the day or at night time! I wouldn't say I'm a pro at the cat flick BUT I do have it pretty well mastered. I'm always asked how I manage to get my liner looking the way it does, which I did write a post called 6 easy steps to create the perfect winged eyeliner... which shows you how I create my flick. A big part in creating the perfect cat flick, or liquid liner in general is down to the tools that you use. I have tried too many liquid liner products throughout the years and personally I've found that the felt tip liners are the best ones to use. They have the flexible thin tips, so that you can create a thin line easily, but they also have a large bit, if you want to make the liner slightly thicker. Now don't be fooled, not all felt tip liners will be very good. Some are very hard and literally drag against your eyes, some are just too flexible that all you'll be able to create is a big splodge! I have trialled many out and have narrowed my favourites down to five, and you'll be pleased that all but one can be found in the drugstore, so they're very inexpensive! Maybelline Master Precise Liquid Eyeliner, £5.99 I picked this up on one of my many hauls in Boots. You know when they do the 3 for 2 across all of the brands? I was looking for one more product (it always leads to two more, then you need to get another one for the offer and so on, it's never ending!) and as this had the exact tip that I love, I thought I'd give this a go! I really like this. It's flexible enough to create a flick effortlessly and the colour is quite a deep black. It's not the blackest mind, but two coats is enough to make me happy! I'd say this dried out after 4 weeks of use, a little sooner than I like to be honest BUT at only £5.99, and when you can normally pick this up as a free item it doesn't really matter! If you're after a budget liner that can do the job perfectly, then this is the one! L'Oreal Super Liner Perfect Slim, £6.99 You have probably seen me mention this eye liner a lot on my makeup looks, in fact I actually reviewed this during my early days of blogging just HERE, you'll also see in that post how the tip looks, which is basically how all of these look, that is my perfect eyeliner felt tip pen! This has to be favourite eyeliner out of them all. I have repurchased this time and time again, and despite owning more eyeliners than a normal person needs in their life, I will continue to repurchase this. It's basically perfect! the colour is a deep black, one coat is enough. This doesn't dry out fast (lasts around 2 months) and looks pretty sleek too. The price point is amazing too. If I had to choose one eyeliner that you needed in your life then this is the one! Seriously, go out and buy it today, do your eyeliner and then come back and tell me how easy it is! Perfection! Bourjois Liner Feutre, £6.99 I know there is a lot of Bourjois fans out there! Bourjois tends to sit at the higher price range and quality out of the drugstore brands, it's easy to know why as they are so similar to Chanel, which unless you live under a rock, you'll know they own Chanel, which is why they are so similar! This probably lasts the longest on my eyes out of all of these and is 100% smudge proof. This is an intense black, has the tip that I keep talking about and is really easy to use. Eyeko Skinny Liquid Eyeliner, £12 The most expensive out of them all, but an amazing eyeliner! I actually got this free with a Glamour magazine the other month. I'd seen this raved about on blogs and this is Alexa Chungs favourite eyeliner too! The reason I never bought this was because I didn't fancy paying £12 when I have eyeliners that are cheaper and that make me happy! I'm actually going to be posting a review this month on the skinny eyeliner so I wont say to much, except this is amazing, it's worth every single penny and is almost my favourite eyeliner! Topshop Magic Liner* £6.50 I actually featured this in my July Beauty Favourites so I wont rehash what I said previously. This is virtually the same as my L'Oreal Perfect Slim Liner to look at and the finish. The packaging is super cute and the price point is amazing too. I think I used this every single day in July and I was gutted when it dried out. I would definitely repurchase this. So that's my Top Picks of felt tip liquid liners. These all basically do the same job and aside from the Eyeko Skinny Liner, are all very similar prices. They all look the same too! 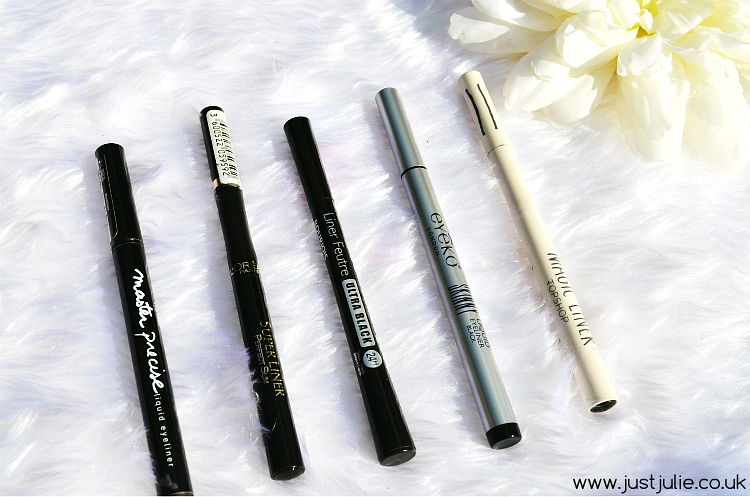 These five eyeliners make applying liquid liner or creating a cat eye flick sooo easy, it's criminal.... If you have struggled with doing your eyeliner then I really recommend that you give one of these eyeliners a go, follow my tutorial that I mentioned at the start and I guarantee people will be asking you how you managed to get your eyeliner so perfect!